With the alarmingly high cases of diabetes, attention to diet has become part and parcel of living with this disease. And nowadays you can enjoy many more carefully prepared foods than ever before. Apart from the deliciously good-for-you recipes, the experts at Better Homes and Gardens also supply interesting and informative information on the different types of diabetes, and two great sections: "Cooking with Sugar, Blends, and Sugar Substitutes", and "Food Exchanges". We have the following courses: Snacks and Beverages; Breads; Breakfast and Brunch; Beef, Pork & Lamb; Poultry; Fish & Seafood; Soups & Stews; Salad Meals; Sides & Salads, and Desserts. Some delectable recipes include: Parmesan Corn Bread; Southwestern Breakfast Tostadas; Mustard-Maple Pork Roast; Moroccan Chicken; Grilled Halibut and Leeks with Mustard Vinaigrette; Tuscan Bean Soup with Spinach; Steak and Mango Salad, and Double Chocolate Brownies. 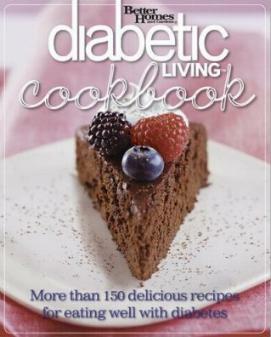 You can enjoy a full range of meals and still maintain a healthy and diabetes-supportive diet. And you can happily serve these meals to everyone, with or without diabetes. There are also personal stories from children and adults which are inspirational. Partially illustrated. Nutritional guides given. Conclusion - A great selection of recipes to inspire healthy eating.